I woke up grumpy. Reviewing the previous day's events I realized I was disappointed that I hadn't sold the one painting I'd entered in a local art show, but I was probably even more grumpy because I'd gone to see a documentary, "Source to Sea: The Columbia River Swim," about Christopher Swain's experience swimming the entire length of the river. For those of us who have been paying attention to what's happened to the "great river of the West" - the pollution, dams, radioactivity, clearcuts, all leading to water that really isn't safe to drink and maybe not to swim in ... it's a discouraging story. At the same time, the film is a nice-to-look-at visual presentation of all the threats to the river. Actually they're more like wounds than threats. Insults, threats, blows, wounds, death: Isn't that the progression? There were many parts of the film that brought tears to my eyes, especially, of course, the inundation of Celilo Falls. Maybe it's my fishing family connection, my Finnish-American reliance on fish in my diet. Maybe it's having spent most of my life within an easy bike ride of the river itself. Maybe it's being exposed to "rivers" elsewhere that looked like creeks by comparison. One of the people in the film referred to "our beautiful river." The Columbia is beautiful, but once again, a superficial beauty - literally on the surface - can lull us into thinking everything's okay, even though the river's problems are like a cancer in an internal organ, a disease with few obvious symptoms until it's so advanced that there's no turning back. Given all the problems besetting the Columbia, it's hard not to be confused about where to start, which problem to tackle first, which one is the most pressing, which one poses the greatest threat, which one is most amenable to amelioration. It's hard not to be disheartened. 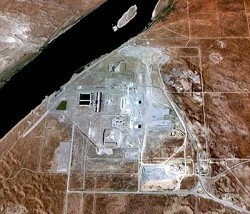 Probably the biggest and most intractable issue facing the river was outlined in the July, 13 Observer editorial: Radioactive materials continue to flow into the water table from the Hanford Nuclear Reservation and 20 years of clean-up efforts have done relatively little to stanch the flow. The editorial states that 26,000 pounds of deadly plutonium is buried near the Columbia, "three times what the U.S. government has previously estimated." Over a 30-year period beginning in 1944, there were a series of intentional and accidental releases of radioactive materials into the air and water from Hanford operations, according to documentation by the Hanford Health Information Network. The federal government made the mess under the rubric of "national defense," but has been unwilling to provide the money or attention needed to do effective cleanup. One of the film's speakers said he thought there's so much money to be made, the contractors really don't want to clean it up - ever. Everyone can relate to the problem of radioactive waste making it into the river and therefore contaminating everything alive in its contact. The immensity of the problem and the fact that it is under the control of the federal government are barriers that feel insurmountable for ordinary citizens. The other major issue facing the Columbia is the Bonneville Power Administration's system of giant dams - but on this one, we're all complicit. Every time you leave the lights on, run your electric dryer or spend time surfing the net, you're complicit. The big dams make fish passage difficult and also raise water temperature, making the river less hospitable for fish survival. Until people are willing to use less electricity, those dams will remain standing, salmon runs will be impacted and economic and social justice for native people who fished Celilo won't happen. But, using less electricity won't be enough unless we also force policy changes. Right now, "surplus" power goes to the national grid, usually in the spring. As long as that's the case, whatever you and I save in kWh just lights up part of Las Vegas. Until we curb our appetite for electricity, modifying or removing a dam to allow another section of the Columbia to run free remains a remote possibility. I can feel hopeless about all this, but I have to remember it all happened in increments and can be repaired in increments and there are a few areas where we as citizens, through our state and local governments, have more influence if not total control. Policies covering land use, industrial effluent, and timber practices are still under state jurisdiction for the most part and can be restrained by local policy ... and our individual actions.